I love using masks and stencils to create scenic windows. These I made using a Spellbinder's large oval die from a piece of cardstock, lay over my card front (4.25" x 5.5"), spattered with Frisket, set aside to dry, Added a punched out circle for the moon, then sponged with Distress "Faded Jeans" & "Stormy Sky". Removed the circle and sponged a bit more blue across the moon, then removed the Frisket to reveal the snowflakes. With oval stencil still in place, stamped my scene. On the 1st card using Memory Box "Deer in Field" stamp with Versafine "Black Onyx". On the 2nd card using Art Impressions "Covered Bridge". I colored the bridge with some Distress markers. Removed the stencil, stamped the larger pine trees (Stampscapes "Nature Sheet #4") with the black. 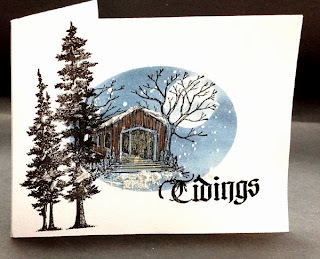 Also stamped the quote (Quietfire Design) or part of the quote with the black and clear embossed the word "Tidings" only. On the inside of the 2nd card, stamped the same scenic stamp and the rest of the quote. 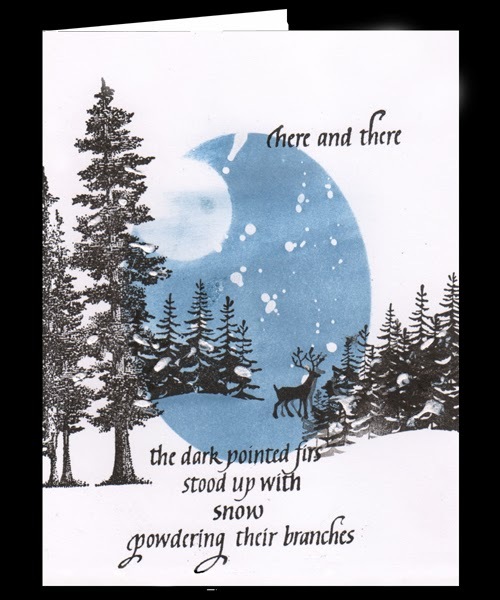 As a final touch added snow on the pines, roof & path using a Deco Art "Snow Writer"
Fabulous card. Thank you for joining us at C.R.A.F.T Challenge. Good luck!